Here’s a funny thing. 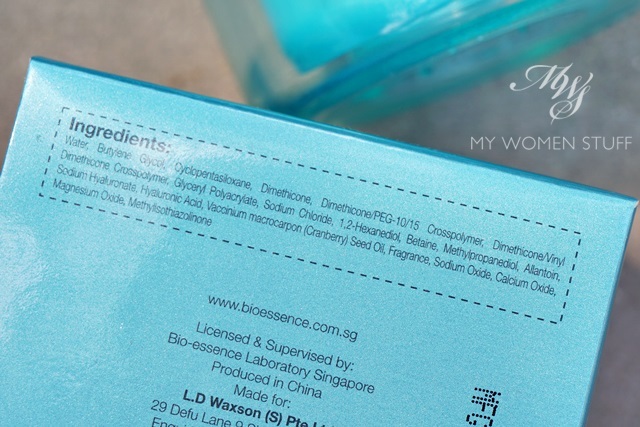 Bio-Essence is a brand from Singapore available locally in most pharmacies and has been available for years and years. I’d actually watched the brand launch from Day 1 (almost) and truth be told, knowing their origins, I was never very sold on their products or claims so I’ve never tried their products. Yet, when I saw that this very same product was being sold at almost TRIPLE its price online in the UK, and been given cult status by “gurus” no less, I had to see what the fuss was about! Tsk. The power of suggestion eh? 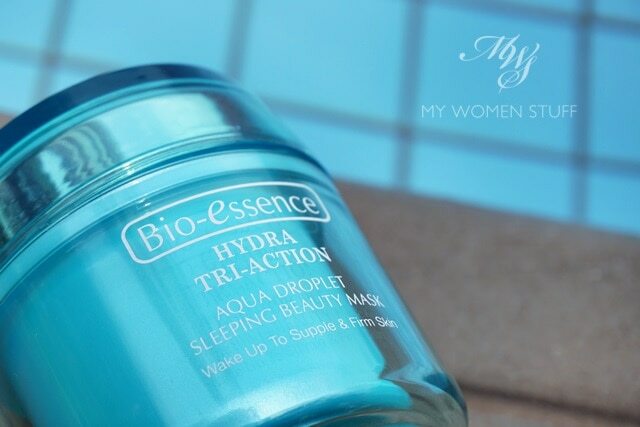 This, which to give it its full title, is the very wordy Bio-essence Hydra Tri-Action Aqua Droplet Sleeping Beauty Mask *takes deep breath* and the cult status product in question. This is sold at £29 online here which at today’s exchange rate is about RM172. It retails at local pharmacies at RM70 (£11) or so and it could even be much less when it goes on sale, which is often. I purchased this at about RM55 (£9) or thereabouts! I basically stood in the aisle at Watson’s pharmacy giggling dementedly to myself when I saw the price. I think the sales person left me alone because I looked off my rocker LOL! 😀 This must be what people must feel like when they go to Europe/France and see how cheap French pharmacy skincare is, and how much more expensive they are in other parts of the world or online. But the big question isn’t about the price, it’s about whether I feel this deserves its raves as a cult product. My answer is no, it doesn’t. But it is a pretty interesting product that does a RM55/£9 job. I wouldn’t pay the online asking price so if you have friends in South East Asia, ask them to pick you up a tub. What makes it interesting? The Aqua Droplets thing. Let me show you how it works. On left, I’ve shown you a dollop of the product scooped out of the tub. It’s an opaque white and it feels very very silicone-y. A word of warning. You mustn’t be squeamish about silicone in your skincare products if you want to try this because it almost feels like you’re slathering silicone on your skin. But rub at it and spread it out, and it almost magically creates water droplets on your skin, as you see in the picture on the right. This bit is rather fun. Most of the thick silicone-waxy feel is significantly reduced, but it is still there. It does not absorb fully into my skin, although the water droplets will. This Bio-essence Tri-Action Sleeping Beauty Mask is first and foremost, marketed as a sleeping mask. So, like all sleeping masks, what you do is, at the end of the day, after cleansing and toning, apply a fairly thick layer of product to your skin, rub it so it turns into water droplets, pat it into your skin and go to sleep. It’s supposed to hydrate and rebalance your skin. Personally speaking, I find that it gives a bit of an instant boost of hydration to the skin when the water droplets are absorbed, but it doesn’t last. I also won’t use this in the day although they say you can, by using a thin layer of product instead. The reason I say so is because the thick silicone feel puts me off, and it never really absorbs, sitting on the top of my skin like a layer of grime. The other reason I’m not enamoured with this, is the scent. Not many people mention this, and perhaps some people might even like the scent, but I find it too strong and too floral. It’s not unpleasant, but it’s there and I don’t like it. If I were going to use a sleeping mask, I’d still pick the Laneige Sleeping Mask for hydration and the Sulwhasoo Overnight Revitalizing Mask for an instant overnight pick-me-up. I’d even pick the sleeping mask from The Body Shop despite it’s strange texture over this, for efficacy; but I now have this, I’ll use it. But it’s not a repurchase, that’s for sure. 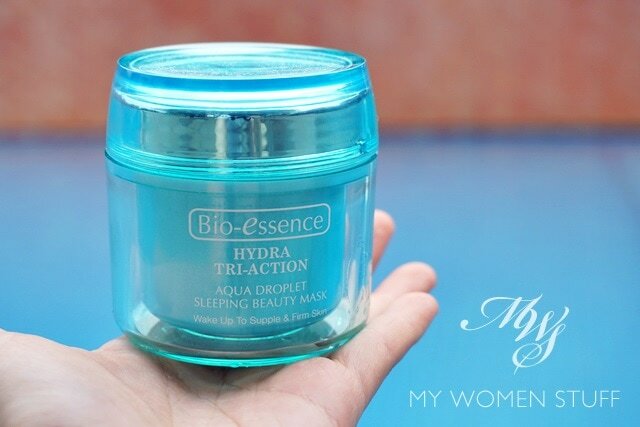 The Bio-essence Hydra Tri-Action Aqua Droplet Sleeping Beauty Mask is a highly raved product that has been given cult status, but one which I feel falls far short of being a cult product. It is a sleeping mask with a bit of difference, in that when you rub at it, water droplets will appear and sink into the skin. However, it is packed chock-full of silicones that leaves a layer on the skin no matter how much or little you apply. I’d use this only for they say this is – a sleeping mask that you’d use 1-2 times a week. Don’t use it daily because I think there are far better products you can use as a daily hydration serum or cream. Here is the ingredient list of the product for those interested. Have you tried this Bio-Essence sleeping mask? Do you think it’s worth the cult status it’s been given? I think it’s more like “Power of “Curiosity”, haha. This product sounds like Touch & Go; not going to get another jar after the first one is finished. I like the idea of sleeping mask where you can just slap on your face, go to sleep and wash it on next morning. But if this is not going to make any difference compare to use my daily hydrating regime, I’ll pass and find something else. But if someone is a first-time to use overnight hydration mask, this might sounds a safe bet to experience. Oh yeah its the same water in spray can..similar to avene thermal spring water…bio-essence ones you can find in any pharmacy in KL mostly pack of 3 on sale…its really refreshing, hydrating and amazing on hair! I know it sounds weird but my hair is very dry and prone to knots and few spritz of bioessence spring water and everything is sorted..plus it makes my hair soft and silky as well! I just wished it was available online i would have ordered in a heart beat! On hair! That’s so interesting and what a great way to refresh tired hair 😀 Have you looked on sites like Sasa? I thought I’d seen it before but I could be mistaken! It’s amazing how beauty and skincare can get crazily marked up, huh? I wandered into Sasa the other day (I put on a brave/bored/don’t talk to me face – it sort of worked) and saw they now carry Wet N Wild, which is like the definition of inexpensive drugstore makeup for us Americans. Lo and behold, the markup was highway robbery! I felt the same way about the Canmake products being hawked at Sasa for RM45 when they’re really like JPY 500 – the Malaysia markup is triple! I didn’t get a good look at the prices on Wet N Wild but I’m sure other folks can confirm it’s probably at least triple the price than in the U.S. Sigh. On another note, I don’t think I’ll try this sleeping pack because I’d rather just use a heavy-duty nighttime moisturizer (right now I’m using the Sukin night cream that I got on super sale at Vitacare, I think). But props to Bio Essence for making it big in the UK, I guess? I just tried it out in the drugstores here in Singapore where it’s on sale at around S$25 (about £12) with the normal price being S$34. What I find odd is that none of the UK bloggers seemed to mind that such a pricey product was made in China even though it’s developed by a Singapore company. For the UK retail price, you can get much fancier brands made in Japan or Korea. I agree that the scent is quite strong and the silky siliconey feel is there. Curiosity rather than blind allegiance to the UK beauty gurus led me to Guardian to buy this, so astounded was I by the fact that something considered cult in the UK is available so easily and for so cheap (in comparison to the UK selling price) here. It’s an OK product, does its job. But not something I will buy again after finishing it up. LOL at the sales staff scared by you giggling to yourself at Watson’s…. Hahaha I know exactly how you feel Kay! I was all “OMG Bio-essence? Seriously? I can actually buy it here!” and then it goes and disappoints us tsk! I’m curious about the science behind the water droplet formation. My (non-chem but science bg) guess is that the rubbing action releases water trapped in the cream… But most moisturizer creams do contain water as first ingredient, it just doesn’t release immeidately or as such obvious drops. Anyway i prefer plant oils based moisturizers which draw/contain water and prevent water loss from skin – ie do the same thing as this without the silicone. Using purist a’kin for my (mild) sensitive combi oily and dehydrated skin (wtf right) for over a year as it works well for me. May give sukin a try for fun. I’m aiming to make my own facial creams as it would force me to learn about the functions of each ingredient and the trade-offs involved. Thanks for sharing this! I’m quite happy with my Laneige water sleeping mask, so I’ll probably give this a miss. When I was shopping on cultbeauty, I knew this brand is familiar! The price.. is unjustifiable on cultb. Like the mark-up is ridiculous. Paying that kind of money for a tub of ‘stuff’ that just forms water droplets and barely hydrates the skin for me (I tried it, it didnt hydrate, just made me think that it did because of the droplets). I thinm the hype just comes from beauty bloggers (unnamed bblogger even included this in their must-haves beauty box *cough*) and the fact that the asian skin-care trend is popular currently just because we ‘look’ younger, etc (as in your previous post haha!). It’s on the expensive side for a product you’d buy at Boots or Superdrug (high street) but inexpensive compared to department store skincare or some of the other Asian brands over in the UK. I don’t quite see what this does that a good moisturiser doesn’t. A step by step guide with recommendations for Asian brands to try would be cool. I’m reluctant to try things on spec as some of them are too expensive to take a chance on. Thank you for mentioning the fragrance! I tried this, and the smell was too overwhelming for me. I hoped that it would dissipate after a few minutes, but I had to get out of bed and wash it off. I hate to waste product, but I couldn’t stand to use it, even for a few minutes as a regular mask. Teach me something new that you’ve been doing for years, all those Asian skincare things must have their own hidden secrets with sheet masks, essences, whatnot. Also it’s completely bonkers how cheap French Pharmacy stuff is here and horribly expensive elsewhere. You must get the same thing with local brands no doubt. We have to import it, ship it and get it hyped to get our hands on it.. while the regular stuff here is “boring” and “too easy to get” so it’s overlooked. I would go RAMPAGE in Asia hands down, follow the trail of melted credit cards haha. I wish we could just teleport stuff 😛 It’s all the import taxes and shipping costs that add on. Oh and in my case, a really weak exchange rate as well. The same way you’d go mad here is the way I’d probably go mad in Europe! Gimme all the French pharmacy!! haha! Bio-essence has cult status in UK… :0 You have got to be kidding me says the beauty snob in me. Good thing I read your review first. I don’t like the silicones. Maybe the waxy silicone-y feeling works better in colder climates. In M’sia, it just feels heavy sticky. I share your sentiments. I was giggling too! With one look at the list of ingredients, I know I would pay no more than $2. The most valuable ingredient in this product is allantoin, which is a whitening agent, and hyaluronic acid, a moisturizing agent. I can find products with allantoin in them in Daiso. Products with hyaluronic acid in them are now a dime a dozen. Over the years, I have found only one item from Bio-essence that is worth buying. I had enjoyed their old morning and night moisturizer. This brand is also available in HK and I don’t know it’s from SG (always thought its some Chinese/ HK brand). I got a few samples from their products in the past and never really like them. Their products are too “artificial” that give an uneasy impression. Lol, finally…someone also noticed the cult status of this product vs its average performance. I have seen it on Cult Beauty when I was browsing the cult likes of Sunday Riley and Omorovicza. Like you, I also marvel at the price point in our regular drug store and it did cross my mind to try it. But I was not convinced. Lol I agree with you ! An average sleeping mask turned into a cult product for whatever reason (money!). The prices at this Cultbeauty shop are ridiculous. The sell acne patches for 10£ when we can find them in Korean shop for 3$. The “droplet technology” is so useless btw. Every time I see a texture like this it just tells me that the product is FULL of silicons. “whatever reason” I like that 😉 I think Cult Beauty is fine because I shop there a bit for UK/international brands, where the prices are fairly consistent/retail. But this one, I had to question and you say there’s a 10 quid acne patch?! WTF 😛 I went to look and I think it’s actually the fault of the brand Cosrx for pricing it so high coz it seems fairly consistently expensive elsewhere too. But Bio-essence? puh-leeze! 😛 I know, I was sorely disappointed in her raves too for this. It did make me question some other products raved about although for the most part, I’ve had good luck with other stuff. You know, Paris, I’ve recently been trying quite a few ‘cult products’ hyped up by different beauty gurus, only to find out they were just alright and nothing amazingly special – for example, the Caudalie Beauty Elixir and REN Glycolactic mask were fine, but so not worth the high price tag for me. Thanks to all Gurus above so leaving d Poor lady who has very dry skin with some wrinkles around the eyes areas now not sure what to buy after all the comments … Or any recommendations ?? Not too expensive products esp. for Night and day. I will be very happy to try and Thank you all. I’m not sure where you are, but if you have access to any French pharmacy brands like La Roche Posay, Vichy, Nuxe etc, they are fairly affordable and effective. Some people have found success in Korean brands although I have personally no recommendations as I don’t use any Korean brands of skincare. Some of the products I’ve tried with varying degrees of success can be found here.